Te-wa-ten-e-ta-ren-ies is the Indian name for the location where Potsdam now is. It means "The place where the gravel rolls under the feet in dragging up the canoe". 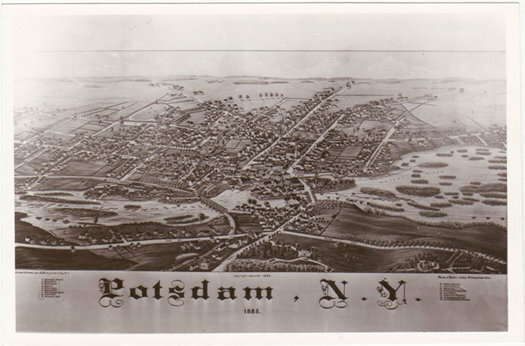 The history of Potsdam and St. Lawrence County dates from the close of the Revolution in 1783 when the newly acquired freedom developed a great desire for the extension of settlements. Almost nothing was known about this part of the State. Previous to the Revolution, great tracts on both sides of the Hudson and Mohawk Rivers had been granted by patents by the English crown. The most northerly of these was the Totten and Crossfield Purchase which forms the southern boundary of St. Lawrence and Franklin Counties. In the map of Canada and the northern part of Louisiana in Jeffrey's "French Dominion in America", the country north of this tract is described as "the deer hunting grounds of the Iroquois". In Delisle's Atlas of 1785, this section and the northern part of Vermont is called 'Irocoisia' (Land of the Iroquois), and on another documentary map of New York it is called "Coughsagrage" (the beaver hunting country of the Six Nations). Across our two counties is written the following: "Through this tract of land runs a chain of mountains, which from Lake Champlain on one side, and the River St. Lawrence on the other side shows their tops always white with snow, but although this one unfavorable circumstance has hitherto secured it from the claws of the Harpy Land Jobbers, yet no doubt it is as fertile as the land on the east side of the lake, and will in the future furnish a comfortable retreat for many industrious families". A need to promote the settlement of the state led the legislature to take early measures for bringing into market the unpatented lands. An act was passed May 5, 1786 providing for the sale of land, and creating land commissioners to dispose of the land. Prior to this act thee were four main Indian trails through the country. The most important trail was the water route on the Mohawk River, across the carry where Rome now stands; down Wood Creek, across Oneida Lake, down the Oneida and Oswego Rivers to Oswego. First an Indian war trail, it later became the chief highway of the fur trade to Albany. The second was the route Sir John Johnson followed when he fled to Canada - from the Indian village (Caughnawaga) now Fonda, it led to the Sacandaga River, Racquette Lake, down the Racquette River to the St. Lawrence at the Indian Reservation of St. Regis. The fourth train was from Onondaga Castle, south of Syracuse to Clayton. With Carleton Island still in the hands of the British (and Ft. Oswegatchie) and Sir Johnson's Tory troops settling along the north bank of the St. Lawrence looking across with envy, this no man's land was a source of danger. The inhabitants of the Mohawk Valley had suffered terribly from raids over these trails. If the newly patched up peace were broken and there was every indication it soon would be, the horrors which they had undergone during seven terrible years of the Revolutionary War might well be repeated. To prevent this, it was imperative that this waste land be settled as promptly as possible. An inhabited buffer state was needed. Following the act of May 5, 1786, townships of 64,000 acres, as nearly square as possible, were divided into mile square lots. In every township one lot was set aside and known as the "Gospel and Schools Lot" and another "for promoting literature". These to be as nearly central as possible. 8. Oswegatchie, 9. Hague (Morristown), 10. Cambray (Gouverneur). The principal purchaser was Alexander Macomb who had resided many years in Detroit and is said to have been a fur trader. In the course of his business he had often passed up and down the St. Lawrence and thus was acquainted with the general aspect and probable value of the lands and was probably better qualified to engage in these purchases than most of his associates. In 1792 Macomb became involved by transaction with men in New York by which he was compelled to assign his interest for the benefit of his creditors. Most of the purchase passed to Wm. Edgar and Daniel McCormick. On the same date, Edgar sold to Wm. Constable for $1500.00 the towns of Madrid, Potsdam, and the west half of Stockholm and Louisville. Constable by deed on Nov. 18, 1802, conveyed tracts of land to Garret Van Horne, David Clarkson and their associates excepting parts previously sold to Mathew Clarkson. The land was to be conveyed to the following proprietors, in separate parcels and by separate deeds as follows: Lavinus Clarkson, Hermon LeRoy, Nicholas Fish, John C. Clarkson, Garret Van Horne, Wm. Bayard, the executors of James McEvers, deceased, Thomas S. Clarkson, Levinus Clarkson, G. Van Horne. All subsequent titles in this town have been derived from the foregoing proprietors. In June 1799, Mr. Benjamin Wright, a noted surveyor of Rome, N.Y. (He surveyed the layout for the Erie Canal. See book The Mohawk) arrived at St. Regis with a surveying party of 7 members, Gordon Smith, Moses Wright, Ebenezer Wright (cousins of Benjamin Wright) Clark Putnam, E. Hammond and Benjamin Raymond. Each man had two axe-men and 2 chain-men. Mr. Wright sent Gordon Smith up the Racquette (Indian name Nihanawate, meaning noisy water) to find out how far the river was navigable and what places were suitable for provision camps. He went as far as Norfolk by boat and proceeded by land to the present village of Potsdam where he spent the night under a pine tree on the rocks on the west side of the river (just across the 2nd bridge). Here, far removed from any settlement, he found a tuft of timothy grass. Much pleased with this familiar object, he hailed it as a harbinger of civilization and a herald sent forward to anticipate the future destiny of the country. In the fall the parties returned to Rome, some by water as they had come - that is by the St. Lawrence, Lake Ontario, to Oswego, the Oswego River to Oneida Lake and by Woods Creek, a short carry to the Mohawk and to Rome. Smith and Raymond cut their way thru the forest to Rome. Again in May 1800, B. Wright, G. Smith, Moses Wright, B. Raymond returned by Lake Ontario to finish surveying the tract, returning to Rome in the late Summer.